Cities around the world will be competing to see who can make the most observations of nature, find the most species and engage the most people in the 2019 City Nature Challenge (CNC). 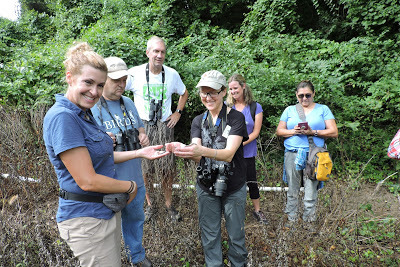 Last year 68 cities joined in world-wide, and as part of the DC Metro area team, Arlington came in 5th place in the number of nature observations posted and 4th overall with 876 participants. Participate by documenting species observations and posting pictures of plants and animals to the City Nature Challenge using the free iNaturalist app. You don’t even need to know what the animal or plant is, with people worldwide helping to identify your observation. This information is used by scientists and nature lovers worldwide. Any observation made during the four-day (April 26-29) challenge will count for the DC Metro Team. There are many chances to participate, either on your own or with one of the local events below. Get prepared for the 2019 City Nature Challenge. The iNaturalist app and community can help you identify that mystery plant, insect, spider, reptile, bird or other organism that has you stumped. We’ll start with a quick introduction to iNaturalist on your smart device, then head outside. Families ages 8 and up. When: Sat., April 20, 10:30 a.m. to noon. Where: Meet at Gulf Branch Nature Center. Register: Use activity code: #632859-G.
Join Arlington County staff in the fun global citizen science challenge. We’ll make our way through Barcoft Park making observations and adding them to iNaturalist. The hourly sessions will include looking for things like insects, snakeboards, fish and more. When: Fri., April 26, 10 a.m. – 1 p.m.
Where: Meet at Barcroft Sports & Fitness Center. Meet at Banneker Park to survey the area. When: Fri., April 26, 2-4 p.m. Kick off your CNC 2019 observations with acclaimed birder and naturalist David Farner at historic Fort C. F. Smith in Arlington. When: Fri., April 26, 8-9:30 a.m.
Meet at Woodlawn Park to survey the area. The Arlington Regional Master Naturalists are sponsoring a series of events and need your help to get better data about our environment. You can help biologists understand the biodiversity of northern Virginia by documenting the organisms you find at this park. This walk is led by ARMN member David Howell. When: Sat., April 27, 8:30-11:30 a.m.
We’ll learn the basics of using iNaturalist, the app for this challenge. Then go out into Gulf Branch Natural Area in search of nature observations to contribute. This is the second day of a four-day challenge, so you can use what you learn today to contribute over the rest of the weekend. Adults, families ages 8 and up. When: Sat., April 27, 10-11:30 a.m.
Where: Gulf Branch Nature Center. Register: Use activity code: #632859-H. Learn the basics of iNaturalist and collect observations in the park. Meet at Barcroft Park to survey the area. Arlington County Naturalist Cliff Fairweather will help us attract and identify nocturnal insects. Afterwards, we’ll retire for refreshments at a local restaurant. Meet at Long Branch Nature center to survey the area. When: Sun., April 28, 7:30 a.m.-9:30 a.m.
Join invasive plant experts from Invasive Plant Control, Inc. and County staff in updating the plant inventory in Bluemont Park along the W & OD Trail. This expands upon the wok started with a grant from the National Fish and Wildlife Foundation and the Northern Virginia Partnership for Regional Invasive Species Management. This is the last day of a four-day challenge, so it’s your last chance to make some more observations. Adults, families ages 8 and up. When: Mon., April 29, 1-3 p.m.
Where: Upper Bluemont parking lot off of Wilson Blvd. Meet at Powhatan Springs Park to survey the area.